RU-486 is a steroid hormone similar in the structure to the natural hormone progesterone. This structure enables it to competitively bind to the progesterone binding site. 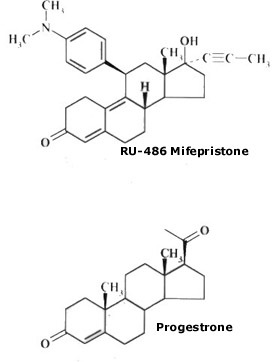 RU-486 can be used for the termination of an early pregnancy (first nine weeks). Therefore, it is also known as the 'abortion pill' or the 'morning after pill'. Other uses for this drug include treatment for fibroid fumors, ovarian cancer, endometriosis, meningioma, and some types of breast cancer.